We plan to reverse the polarity of the neutron flow. Throwing a Doctor Who Christmas special party! I'm in need of clever ideas. Attending will be 7-10 twentysomethings, all geeky and fully versed in the new Who and Torchwood. Only one or two of us have seen older Who. And obviously, a viewing of the upcoming Christmas special and most likely an older Christmas special marathon to follow! Caveat: We're in the US, so getting kids' themed Doctor Who party gear is sort of tough and expensive. I'm looking for any fun or clever ideas to use for this likely drunken, squeeing get-together. Gingercybermen. I've always wanted to make them. A dish of jelly beans for jelly babies? I imagine a Christmas tree could be made to resemble a Dalek. Have everyone dress up as their favorite doctor and/or companion. Celery sticks in the labels, excessive mascara, scarves, simple things like that. Find some creepy little angel statues, or use black paper to make shadows where there should be none. Write the words 'bad wolf' all over, especially in sneaky places. Have a Cloister Bell that is rung whenever anyone does anything funny, clever or dumb. You could make a Dalek, or failing that, a Dalek pumpkin. 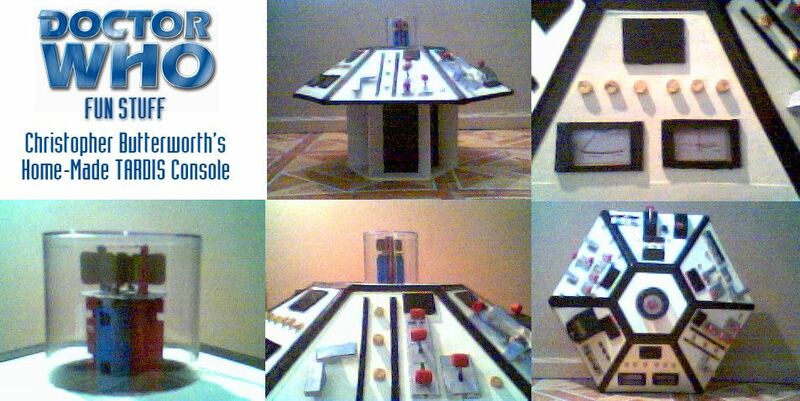 Make a homemade Tardis console as your centerpiece. If you have a round table, you are halfway there! Stick a row of press-on lights on a wall, to look like the console room in the Tardis. Refrigerator box TARDIS in a doorway, through which is another party room. (Bigger on the inside!) Get one of those recordable greeting cards, record the TARDIS sound, and affix card to the hinge of the police box. Keep the drinks and food separated by the TARDIS door to ensure traffic. Replace all the writing you can see with "Bad Wolf"
Super-scary visit from the "are you my mummy?" kid from Empty Child. Starts by calling folks on their cellphones. Then an iPod recording from the stereo maybe, black screen DVD recording with audio. Then appears at the door and tries touching people. Paper mache gasmask. Don't forget the wound on the hand! Sally Sparrow talking to the TV. Use the real one from the DVD extras or create your own! Sally just needs a long colorful scarf and a camera. You can get real jelly babies in the U.S. - and they are delicious! Google for sources. Tardis up the bathroom door. Have Sally Calypso keep the party up to date with the local traffic conditions. Give special prizes to those who carpooled with 3 or more in their car. Bonus points if they dress up as a cat. Also, have some tea and little tea sandwiches/treats. Jackie Tyler always did want to have the Doctor over for a proper sitdown. No, the Christmas tree needs to spin. Violently. If you haven't sent out invitations yet, I suggest that the invitees must bring a banana with them to the party. Always take a banana to a party. Silly drunken party games could include an egg-in-spoon race ("Eggs-terminate! "), anagram challenges of full names (this idea based on DOCTORWHO/TORCHWOOD), pin the tail (hormone cloud/spores/etc) on the alien, Pulp Fiction-style Master-dance-off to that Scissor Sisters song as featured in "Last of the Time Lords" ...Torchwood-type naked hide and seek is optional. @nathan_teske with exploding ornaments of course! You can have a black and white loop of the woman in the television from the Idiot's Lantern. I've also been fond of the Dalek-fedora look. Woe is me to have no friends who have even heard of the Doctor. Holy cow, do I get freaked out just thinking about cowbellemoo's Empty Child idea. You could play (in the background) the video recording from Blink - where The Doctor is holding half of a conversation across time. Here is is on youtube. Make Sally Sparrow's transcript and leave it nearby for more fun. Oh my gosh, I am deeply jealous of this party idea. Last year we made Dalek cupcakes. Take a regular cupcake, bake it tall, and add Dots/M&Ms and toothpicks where necessary. THEY HAVE IMAGINED THEIR DELICIOUSNESS! For the season three finale, my wife and I made a TARDIS cake using Jelly Babies in the batter. They crystallized in the cake and had a really cool effect. Heh. I got help from Mefi finding Jelly Babies in the Twin Cities actually. Admittedly it'd be better for Halloween, but I feel as if 'first Dave' saying "Hey! Who turned out the lights?!" could make for a good time.